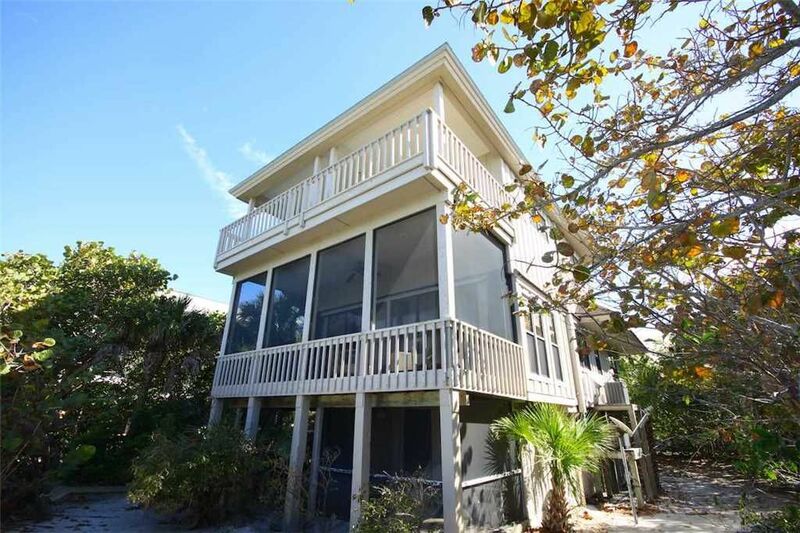 Skylark is an amazing Gulf Front home in a location affording tons of privacy. This fabulous beach house is beautifully furnished and has lots of room to spread out. The living room looks over the beach and has comfortable couches. Skylark includes two golf carts and has awesome Gulffront views. There are two large screen porches facing the Gulf. The kitchen is fully equipped and has up to date stainless steel appliances, All the beds are very comfy with high count sheets and pillows. The home is equipped with a Samsung 55" 4k tv with sound bar including salivate TV. There are an additional 3 32"; Samsung smart TV's in the bedrooms. Up on the top floor two of the master suits adjoin a lovely covered porch for gazing and sunsets. Make sure to make Skylark your next vacation getaway. You won't regret it! Thank you for such a wonderful review of our property! We are glad to hear that you enjoyed your stay on North Captiva Island. We look forward to hosting you again in the future! This property is ideally positioned on the beach!! Great place!! We really enjoyed our stay here. The views from the kitchen were amazing. The convenience of being steps from the beach made this stay effortless. Everything was well equipped and there was plenty of space. The carpets and furniture are showing some wear and the beds were not very comfortable, but all in all this is a great family place to stay!!! Absolutely awesome home / location and amenities are top notch! Our family of seven adults ranging in age from 28 to 82 loved this home / it’s lication on the gulf is awesome! We had no issues at all with the home. We stayed at Skylark in November of 2017. The house is in the perfect location and the view of the ocean from all parts of the house were stunning. The upstairs has two master bedrooms with a huge open porch that runs across both of them and an unobstructed view of the water. The sunsets were glorious and the view of the stars at night was stunning. The main floor has a screened in porch where we ate all of our meals- literally steps from the sand. You can hear the ocean from every bedroom (there are five) and becasue of the way the way the northern part of the island has eroded, the beach basically stops at this house- so the beach in front of the house is very private. The beach is not as wide as shown in the photos- the pictures must be a bit old, but it's lovely. The house is only a short golf cart drive away from the main marina area, and centrally located to the rest of the island. We would return to the island, and to this property, in a heartbeat. Quiet and private, there were mornings walking on the beach where we saw no other people at all. As for the house itself: the good- granite in the kitchen with bar stools, beautiful dining table, linen curtains, pretty sky blue paint, wood floors, and a great layout. There's a bedroom on the main floor with a king bed (no view), 2 bedrooms with queen upstairs that face the ocean, a third bedroom upstairs with bunk beds (full on bottom, twin on top-now view from this room either), and a separate apartment on the bottom floor with a queen bed and bathroom. That room has it's own ground level screened in porch facing the sea, and a separate entrance. Lots of trees on the property, comfy beds, good linens. The screened in porch on the main level was fantastic with comfy couches and a table that seats 4 and unforgettable views. The not so great- the house is showing some signs of wear. The hinges on the outside doors were rusted, one of the upstairs sliding doors had a broken latch, one of the couches was broken, the laminate on the cabinets in the kitchen is peeling off, there was a random mattress propped up in the corner of the downstairs room, and none of the bathrooms has any counter space at all. None of the bedrooms has a closet either- which I thought was strange-only a dresser. The cloth on the couches on the porch was torn as well. All of these things were minor and did not detract from our stay. Anyone who has lived by the sea knows what the maintenance is like! Great island, great house. Our family of 9 adults spent a week in paradise in Skylark. We loved that each of our couples had a bedroom with their own full bathroom! There were plenty of towels in each bathroom. The kitchen was well equipped... ice maker and the gas grill worked perfectly. The real treat was the views on each of the two balconies. The upstairs balcony view was perfect for the sunsets, and the dowstairs balcony was perfect for hanging out because it is screened in.....LOTS of mosquitos in the evening. A/C kept the house very comfortable in all rooms. We enjoyed using the two pools at the club. The two golf carts worked great for our group. There were beach chairs and two umbrellas for the beach and an outdoor shower for rinsing off. The beach towels are in the downstairs laundry room. Washer & Dryer got used daily. We had a wonderful dinner at Barnacles...get the crab cakes!! We also enjoyed several lunches at the pool bar. The service we received at each restaurant was outstanding. We had our own boat and rented a slip from the club. This is a MUST to enjoy fishing & Cayo Costa... Shells were everywhere!!! The beach at Cayo Costa is perfection! We also visited Cabbage Key. I would definately recommend a stay in Skylark and hope to return. Thank you for your review on Skylark. We are so happy hear your family had a great time and we hope to see you again soon!